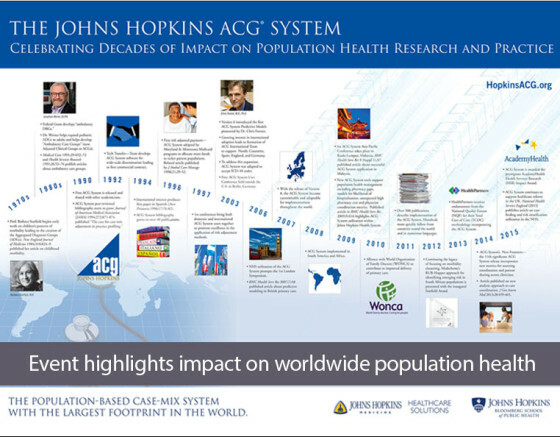 For decades, the Johns Hopkins ACG® System has set the standard for population health care analytics. In recognition of this achievement, AcademyHealth presented the Health Services Research (HSR) Impact Award to the ACG System. Given annually to health services research that has made a demonstrable impact on the worlds of health policy and practice, the AcademyHealth HSR Impact Award acknowledges winners on the cutting edge of population health research. By bestowing this year’s award on the ACG System, AcademyHealth has recognized its status as a global standard, a tool that is applied on a daily basis across hundreds of unique and diverse settings around the world. The ACG System, based upon the work of the late Barbara Starfield closely examines and measures the relationships between patterns of morbidity and health care use while weighing them against cost and outcomes. With each new version, the ACG System has grown in depth and breadth, allowing licensees the flexibility to utilize it to best fit their needs. From population needs assessment, capitation adjustment, chronic care management, predictive modeling and provider performance handling, the ACG System has been continually updated and expanded to reflect the needs and requests of its users. It is this level of specificity and responsiveness that separates the ACG System from its competitors and has enabled it to affect the health care of over 100 million people around the world. To celebrate receiving the HSR Impact Award a panel of experts was convened to discuss the past, present and future of the system. Held at the Johns Hopkins Bloomberg School of Public Health, the celebration featured guest speakers who had either directly contributed to the development of the ACG System or have benefited from its ability to provide clinical context across a wide spectrum of population health uses. The night served to highlight the excellence of the ACG System, in both research and practice, as it continues to improve the quality of care for millions around the globe.